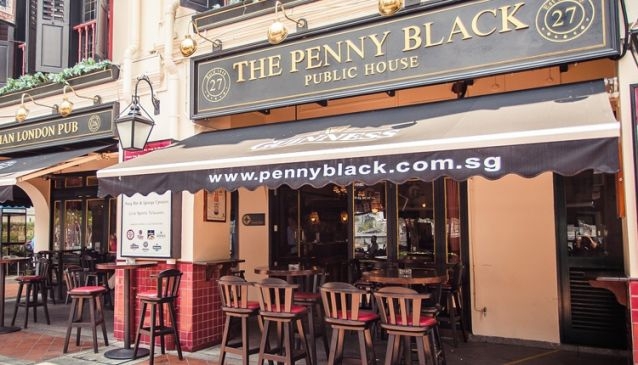 Say cheers to The Penny Black, the first stop in a long row of shophouses from the Raffles Place entrance to Boat Quay. In an authentic representation of a classic Victorian London pub, or public house, everything in this watering hole was designed and built by master craftsmen in England and shipped to Singapore and installed in its entirety. Enjoy your drinks at the al fresco seating area by the Singapore River, chug down your beer indoors in a traditional Victorian-styled tavern, or head upstairs to the 'Snug Bar' where you can dine in comfort. Chow down on freshly prepared hearty London pub favourites such as fish & chips, bangers & mash, pies and traditional roasts.